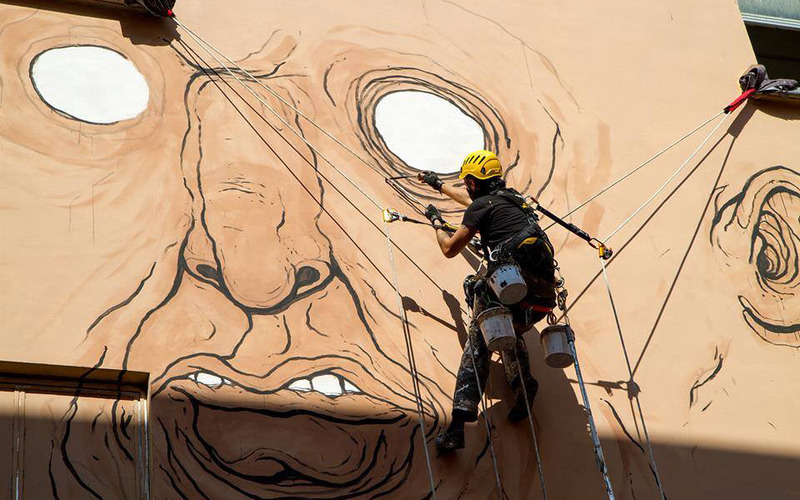 One of the most complicated but at the same time exciting and satisfying aspects of Urban Lives is the organization of trips and projects with artists. 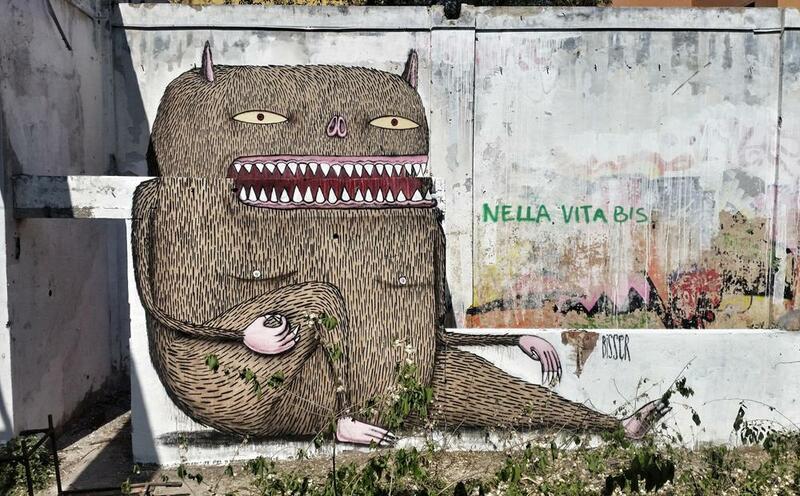 I’ve been travelling around Italy, exploring the underground street art local scenes, or supporting and organizing local events such as graffiti jams, or meeting of artists in abandoned factories. The last trip that I’ve planned and curated has been so far the more complex and enjoyable of my street art blogger life: one week in Emilia Romagna (Italian region), 3 different cities and events and 8 artists. 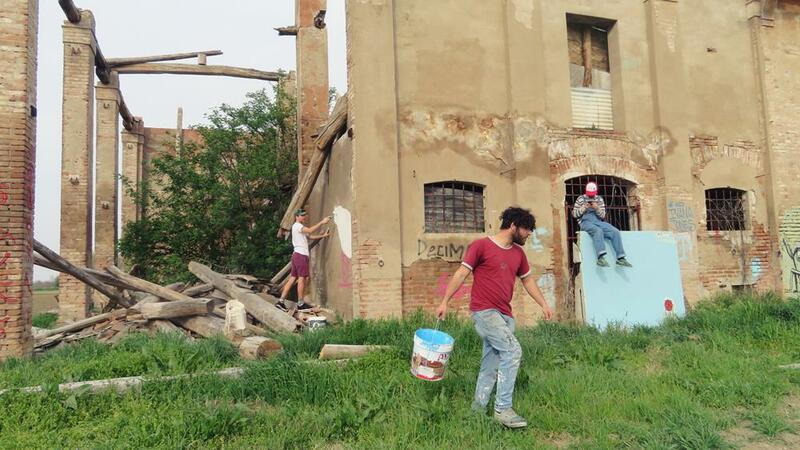 I wanted the plan to include different kind of experiences, such as painting to support a local project in the countryside or a squat in a city, but also meeting other artists and graffiti writers and get in contact with many people. I wanted the artists to travel with locals, to fully understand and enjoy places and traditions (speaking from experience, that’s the best thing to do abroad), to express themselves in different ways and, last but not least, to have fun. As I’ve explained during the trip, I’ve chosen the line-up both with heart and mind: Italian artists (and friends) Nemo’s and Andrea Casciu, because of their art and because they knew and already supported the squat in Bologna (last stop-over), Viennese Skirl and Ruin (who I’ve recently invited in Rome and spent 10 days together), Greek Cacao Rocks (met many times in Athens), Kingsize from 1UP Crew (who I’ve met in Berlin in September), and two artists I appreciated so much but never met, Bisser from Belgium and Digo Diego from Spain. In the last months I’ve been getting more and more involved in graffiti writing. As for street art, I understood that reading, studying, watching videos is not enough, I wanted to go through personal experiences. This long for actions and, let’s be honest, also for adrenaline rush, started in September after a “backjump” experience with one member of the 1UP crew, in a train station in Berlin. From that moment on I’ve met many graffiti writers, collected stories and information, and now I want to go on, as a graffiti reporter on the ground. Moreover, as with street art, I have now good friends amongst writers and I’ve been working on connecting people, from different cities and countries. That’s exactly what I wanted to happen the first day of this crazy trip. 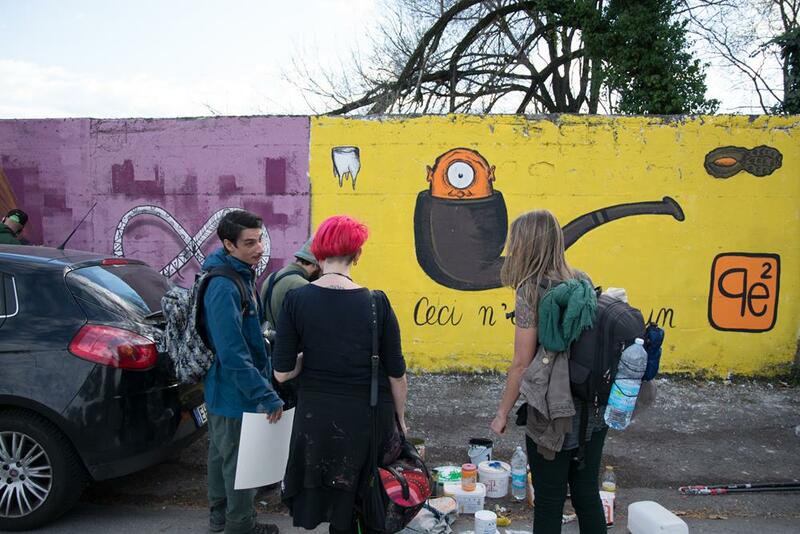 So I asked the 1UP to arrive one day before the others, I invited my friend Irwin from Milan, and I phoned my friend from Reggio Emilia city, Psiko Patik, to arrange a graffiti night with local writers. 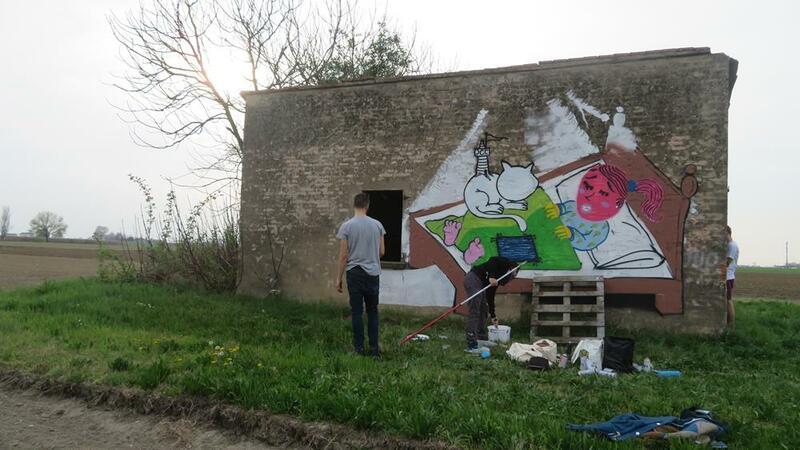 First place of the travel itinerary was Cento (FE), small town where I’ve already spent some days last summer, to support, with a street art jam, a local project called “Rurales Emilia”. 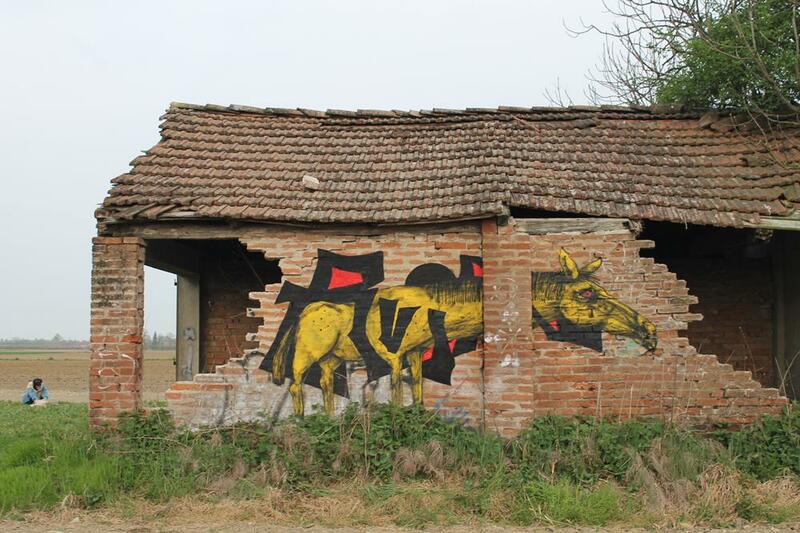 This self-financed and independent project was born one year ago, to sensitize people to problems that afflict the countryside in that area, such as loss of biodiversity and growing urbanization, by calling artists and make them paint on ruins (what is remained of small farm-houses). So, first person I’ve met when I’ve arrived by train in Bologna, was Alessandro Gallerani, creator of Rurales Emilia and agricultural engineer. We’ve bought some materials (rollers, paintings etc) and then we’ve picked up Kingsize at the station and met Irwin. Was so strange to meet the German writer in that bucolic situation, since last time we’ve talked we were in Kreuzberg (Berlin), 6 in the night! At first, he started painting on a silos, while Irwin painted one of his dogs on a ruin. After one hour in that beautiful location we moved to a hall of fame, and this time they decided to paint together. I was sure that they’d get on well, and that afternoon was so much fun! 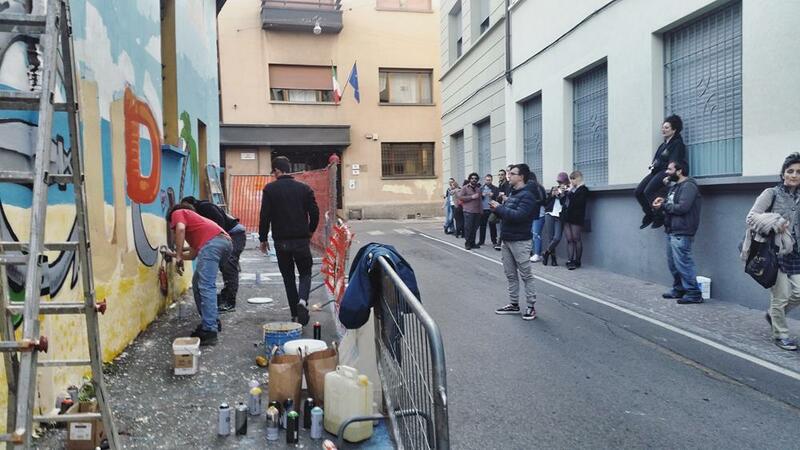 They decided to dedicate their piece to Urban Lives and to “Ale & Ale” (Alessandro and his girlfriend Alessia). The happy mood continued all night long, also in Reggio Emilia. There we meet the writers Psiko Patik (Dls crew), Lante (Dls) and Shake (Hdr) and we had dinner in a trattoria, cheap and typical one. Such a great time: pumpkin tortelli (typical hand made pasta), Lambrusco wine and so many chats, stories and laughs (especially when the 1UP guy told us that the owner of the restaurant looked exactly like Super Mario!). After dinner we’ve been around the city, bombing with spray cans, markers and stickers, then late in the night was the perfect moment for trains. After a funny group shaking of spray cans in the car, singing “La Bamba”, the writers had a quick brainstorming about what to write and how. We were ready to go. While the guys of Rurales Emilia were the lookout, I entered together with the writers. I’ve been missing so much being in a train station at night: only silence and the sound of spray cans and a mixture of peacefulness and adrenaline. Luckily the spot was safe, no problems at all. And the piece was great! When we’ve finished we’ve reached the others outside and decided to go back to Reggio Emilia, for another quick piece in the street and then something to eat at a bakery. When we looked at our watches we realized how late it was, half past five. We said bye to each other (we’d meet again on Saturday) and we’ve returned home. Everybody was sleeping during the journey, except me: I had to check out the sat-nav… and I was too happy! So many people arrived during the morning that was a great mess, but also fun: Cacao Rocks and his girlfriend Eleni (from Athens), Skirl and Ruin (from Vienna) and the group from Bologna, Argo, Flavia (Innesto), Luogocomune and Dielis. All the foreign artists were informed about Rurales Emilia project, and some of them have already sketched something at home. 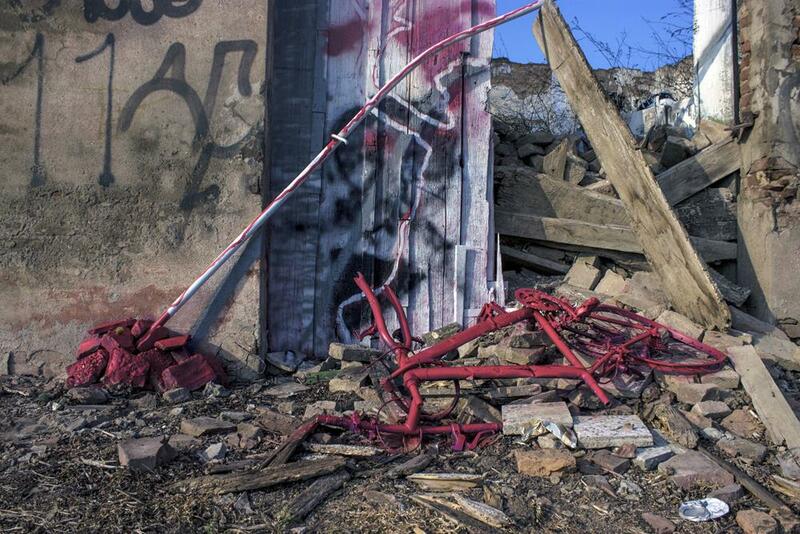 Then we’ve reached the spot with big ruins and many walls, perfect place for a painting day with so many people. It was a sunny nice afternoon, looked like we were a group of old friends in a day trip, or a pic-nic: good music, chats, chilling together on the grass. Talking about art, Irwin and Kingsize decided to work together on a psychedelic, fluo and crazy big painting on a ruin, with a girl sleeping in her bed, surrounded by mushrooms (one of the symbols of 1UP crew) and strange monsters, and dreaming a train full of graffiti. Skirl continued experimenting a new technique (with great results, a mix of abstractism and lettering) and Ruin painted a horse and one of his typical strange flying fish. What surprised me more was the creative, site specific and in situ installation of Cacao Rocks. When finished, he also wrote, with roller and stick, the word “freedom” in Greek, while on the other side of the same ruin the writer Coltre was doing the same. If during the day I felt a familiar mood and harmony between us, was even more clear during the evening at home: pizzas, sketchbooks, a happy chaos and many laughs. During the night Skirl, Ruin and the 1UP have been out for a couple of hours, painting in a station, and Irwin had to go back home. I enjoyed so much the moment and at the same time got prepared for the following day and the long-awaited return to Officine Reggiane abandoned factory, one of my favourite place ever. For the second day of the trip we decided to split in two groups: one group with Cacao Rocks and the other guys from Bologna stayed in the countryside for Rurales Emilia, while me, Cesare/Argo, the guy from 1UP and the Viennese artists left with the car, in the direction of Reggio Emilia. 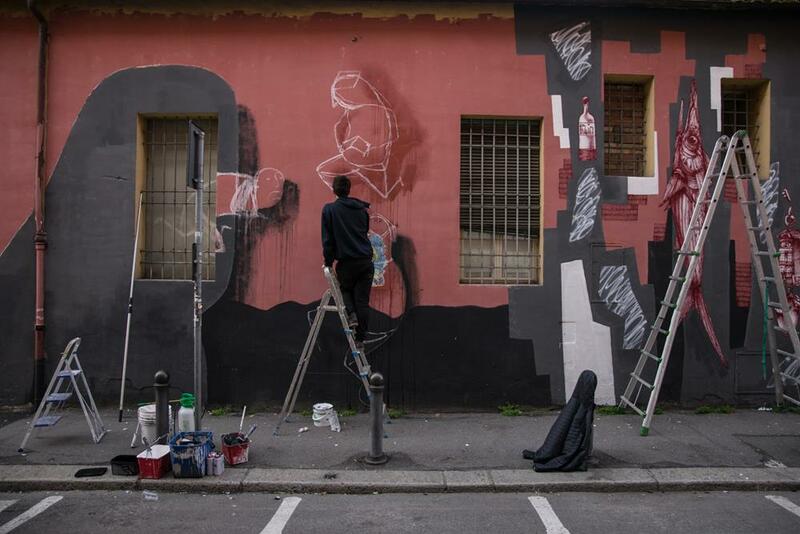 I was so excited to go back to the Officine Reggiane, last times I was there was for a huge street art and graffiti jam I organized with local artists in 2016, and recently for a quick visit with writers (for a graffiti jam organized by Graffiti Reggio Emilia). Let me tell you something about the place: Officine Reggiane is not only an abandoned historical factory. 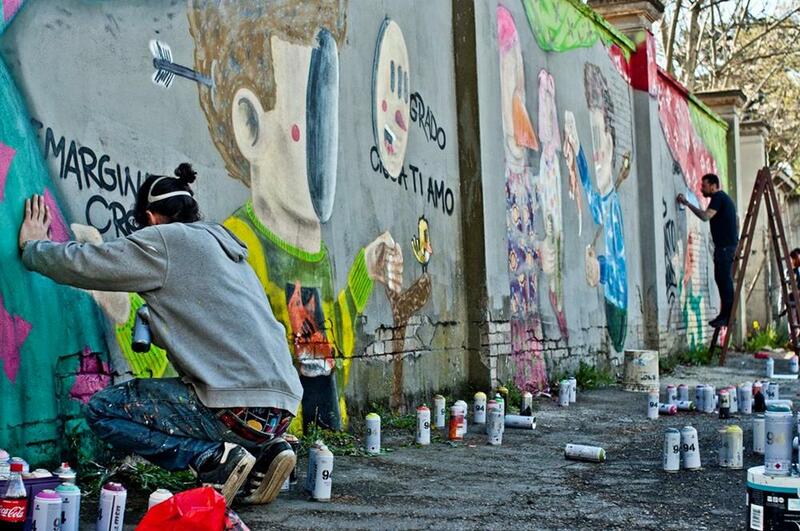 Since 2012 is an important meeting place for urban art, post-graffiti and graffiti writing in Italy. 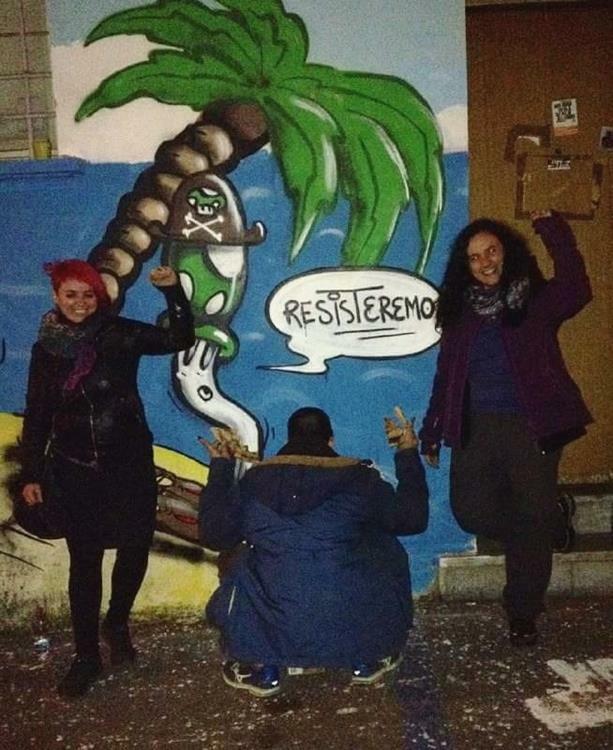 Local artists, on Facebook “Graffiti Reggio Emilia“, started to paint there many years ago, involving artists from all over Italy, but above all they promoted the place and the disclosure of its historical value (for example with a jam organized in October 2016, which was attended by about 50 artists and one of the protagonists of the historical occupation of the factory). All Urban Lives’ fans know how much I supported the local scene and how important this place has been for me, and for my project. Let’s go back to the trip. When we arrived in Reggio Emilia, after chilling in the sunset eating a pizza, we prepared our stuff and went to the factory. While entering the place I suddenly remember what artists Collettivo FX told me the first time I’ve visited “Le Reggiane”, he said that they are “a playground for the artists and the writers”. Of course he didn’t meant that in a vandalic or illegal way, on the contrary, he said that from an artistic and social point of view. I really love visiting the factory with artists who I carry and who have never been there, enjoying their reactions and waiting to see where and how they’re going to interact with the place. It’s so unpredictable where they chose to paint, or if they prefer painting alone or with others. In that case, Argo and Kingsize (1UP) decided to work on a common artwork. They found a ladder in a building and decided to use it, to paint a kind of fight between Titans. 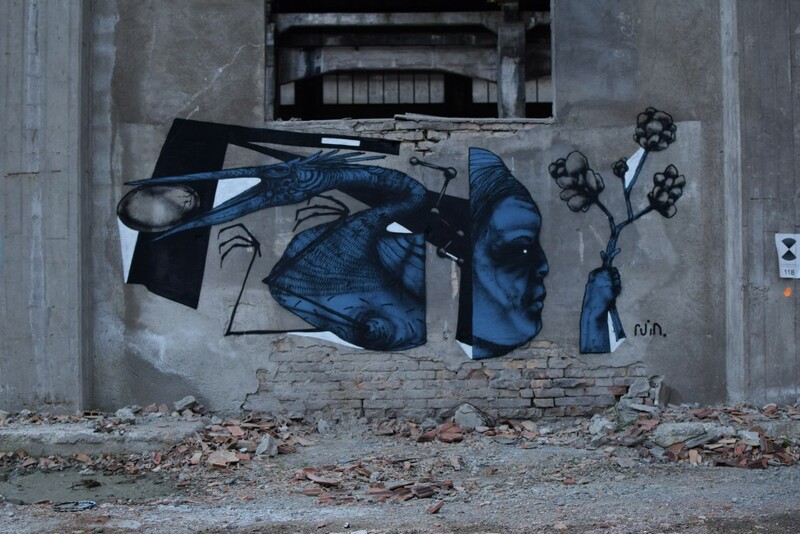 Skirl and Ruin decided, happy and concentrated as always, to paint something like 3 pieces each; when we’ve spent 10 days together in Italy I was already so surprised to see how accurate, fast and original is their attitude as artists. During the afternoon we’ve been reached by Bisser from Belgium and Digo Diego from Spain. I was super happy to know them in person after many virtual conversations and I couldn’t wait to see them painting. 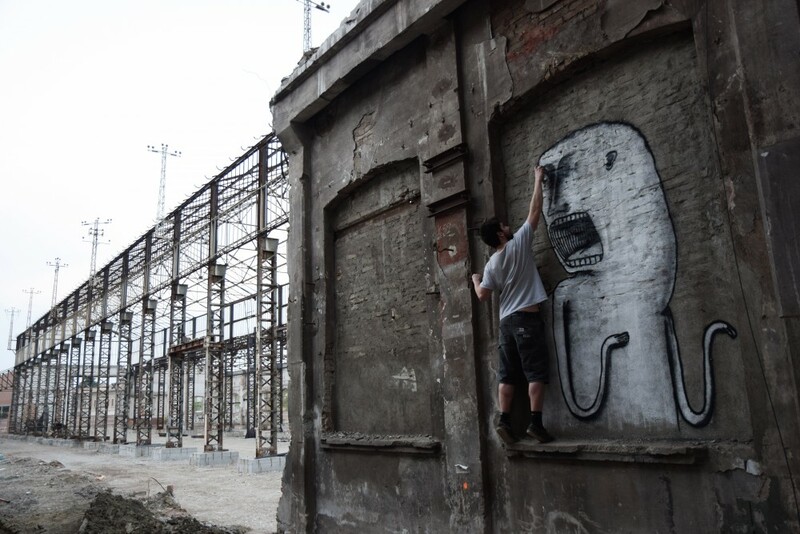 They were both quite tired because of the journey: Digo Diego decided to relax, talk and explore the place, while Bisser painted one of his big character, that seemed to come out from a window (a sort of). Was great to see him studying surfaces and interacting and incorporating the architectural features into the composition (I think he is one of the best artist for that). I was also glad to meet my friend from Reggio Emilia, Reve+: we’ve chatted a lot, while he was panting a dog, in the same building where Argo and Kingsize were. Such a good time that the time flew. I didn’t have much time to walk around the factory, because I prefered to spend more time with them, but during the sunset I was walking with Skirl and Bisser, and as I always like to do during my trips I stayed some steps behind them for a while and took a photo. I love to capture the emotion of the day while the warm light before the sun goes down covers and transforms the crumbling but fascinating landscape that surrounds us. So many stories in that places, so many feelings, so many memories. 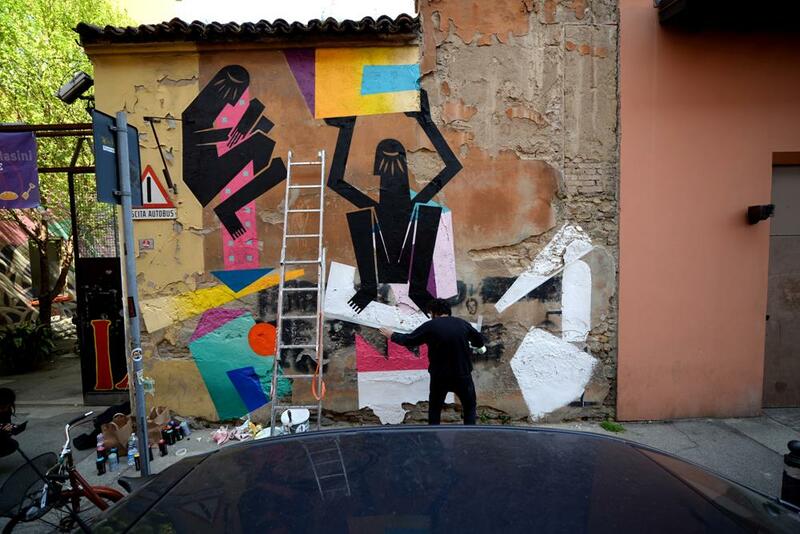 Apart from street art, what I like the most of the scene in Reggio Emilia is that they are like a big family, so focus on brotherhood and connections. I wanted the foreign artists to feel like home with me and them, and have a lot of fun, and that’s exactly what happened! That night we’ve been out for a beer and then to eat in a pub. 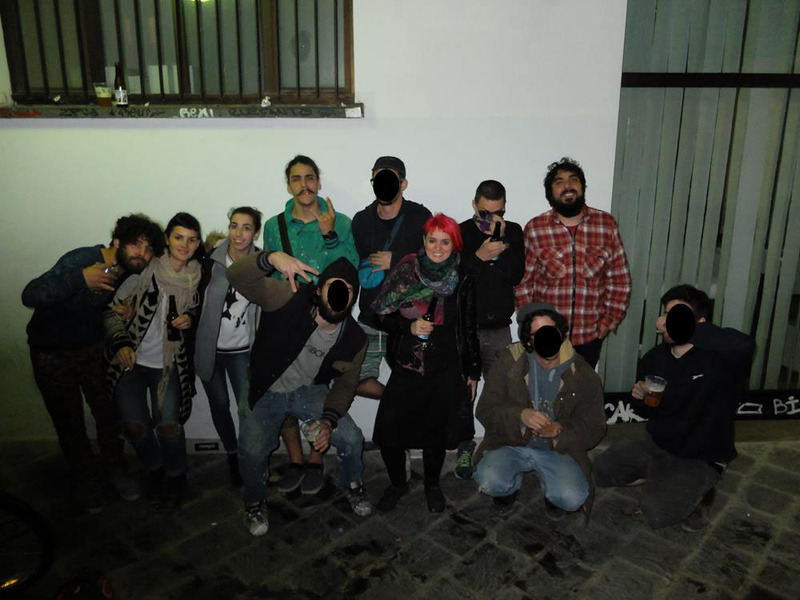 There were so many people, also many local artists like Bibbito (the organizer of the graffiti jam of the following day) and Lo Sbieco, some other writers from Veneto region, a friend of mine from Rome and many others. Great to be all together! But I had to go before the end of dinner: I’ve had arranged another night-time meeting. I carried with me only Kingsize from 1UP and we met my friend Psiko Patik. 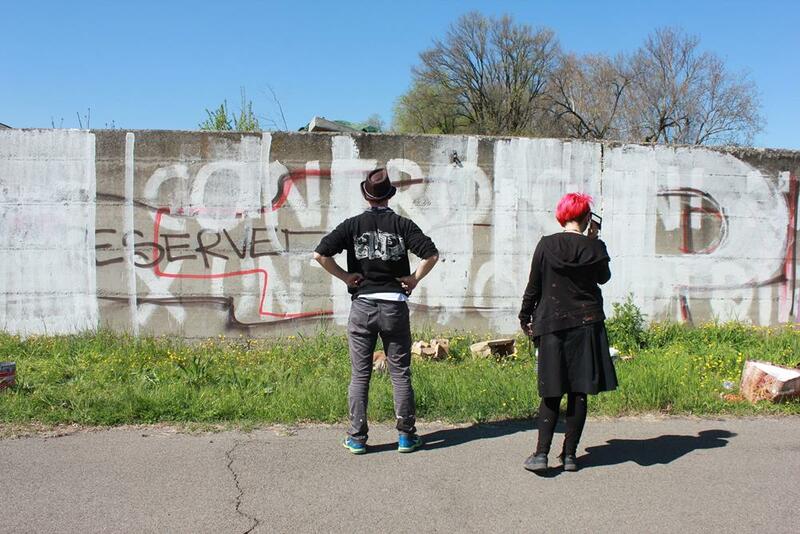 We’ve been wandering around the city and of course whenever we found a good spot we stopped and they painted. Just a quick break at a pub during the night, chatting and drinking beers. We’d really enjoyed being together, and for me was pretty funny to be their lookout and to see drunk people going back home watching at us. Again, I was happy and excited to see dedications to Urban Lives. Amazing day indeed. To organize a big jam like takes time. I still remember a chat with Bibbito in January, while I was in Thessaloniki (Greece): before announcing the date he wanted to be sure I was free that day. I immediately offered support, especially in curating the “foreign artists” part of the event. I was already sure it would have been a successful initiative. Apart from “my” foreign artists, there were artists and photographers from all over Italy. 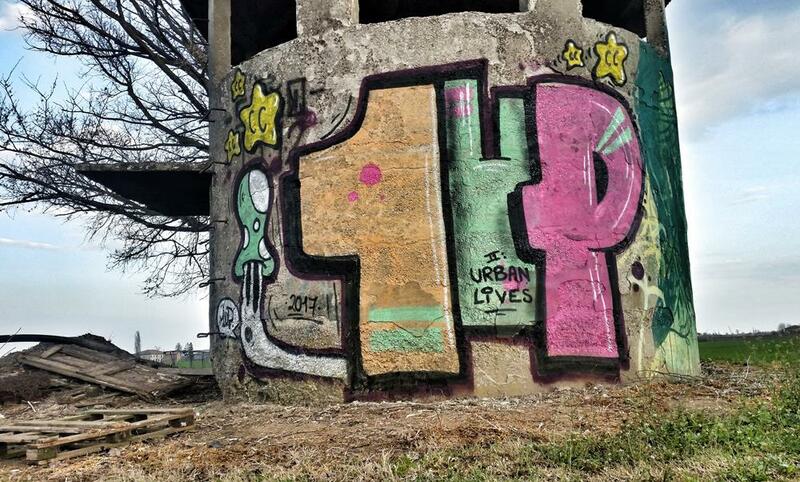 This time also “Urban Lives” was included in the list, a bit weird but how nice! Unlike the jam I organized in May, inside the factory, this one was on the external walls, and just a small part was inside. 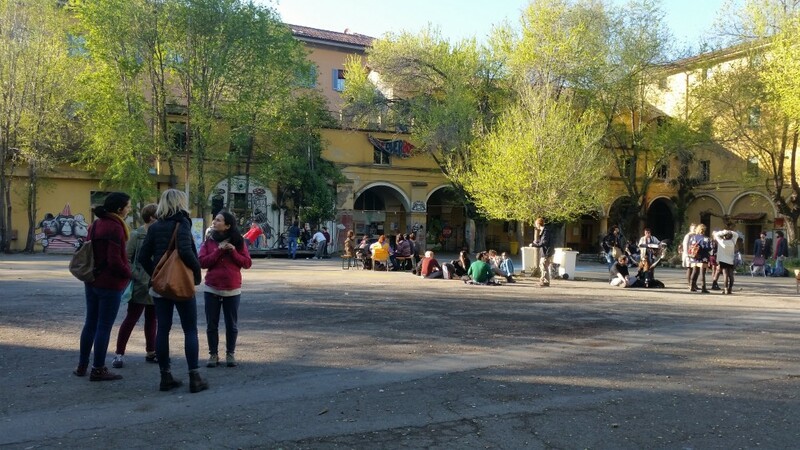 There is no jam in Reggio Emilia without hip-hop music, people on skateboard, beers and sandwiches, a typical quiche with spinach, called “erbazzone”, the local red wine “lambrusco”, and must of all sun, creativity and good vibe! For me was also fantastic to hug and meet good friends I haven’t seen for long time (like Andrea Casciu, Reve+, Pepecoibermuda, Nikka, MrDada, Sfiggy, Pitto Ergo Sum), spend some time with many people. So many friendships are born in front of a wall in my last three years of travelling, but the majority was in Reggio Emilia. I also took many photos and of course I spent some time and took care of “my” artists. I don’t have sponsorships but I’ve done my best for them, also bringing some beers and something to eat. I also thank Cesare/Argo and Alessandro (Rurales Emilia), who helped us with materials. Everything was perfect, I really liked the pieces, was also great to see Digo Diego painting in person, for the first time! 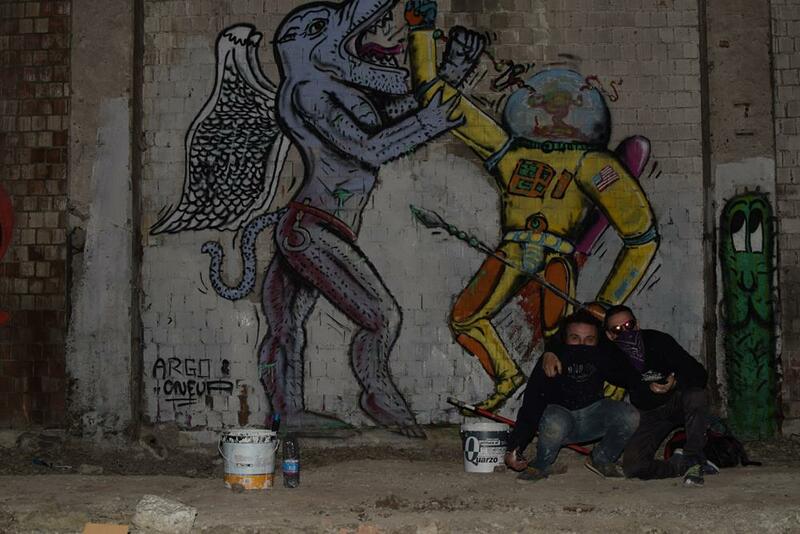 And I was also glad that my friend from 1UP and Psiko Patik, after the painting night, decided to share the same wall. As every jam, artists started to clear out right before sunset. But something great was going to happened, before the end of the event. We’ve been called by Cacao Rocks, who’d spent all day long preparing an installation with materials he found around the factory. Inside the installation there was a build-up of rocks: that was meant to be part of a live performance. When everything was ready the performance of “explosions of spray cans” started. I’ve had already watched some of his crazy srt performances on YouTube in his studio in Athens, but see it in person is so cool! When the jam was finished we said goodbye to many people who had to leave, but for all the others I’ve had booked a “table for 20” in one of my favourite restaurant of the city. Couldn’t been a better conclusion of a wonderful day: great time, tortelli and wine. Last city and the most important stop-over of this intense project was the one in Bologna. That was, in fact, the main reason why I decided to organize the trip. Let me explain something about the squat and how this idea have been taking shape in the last months. 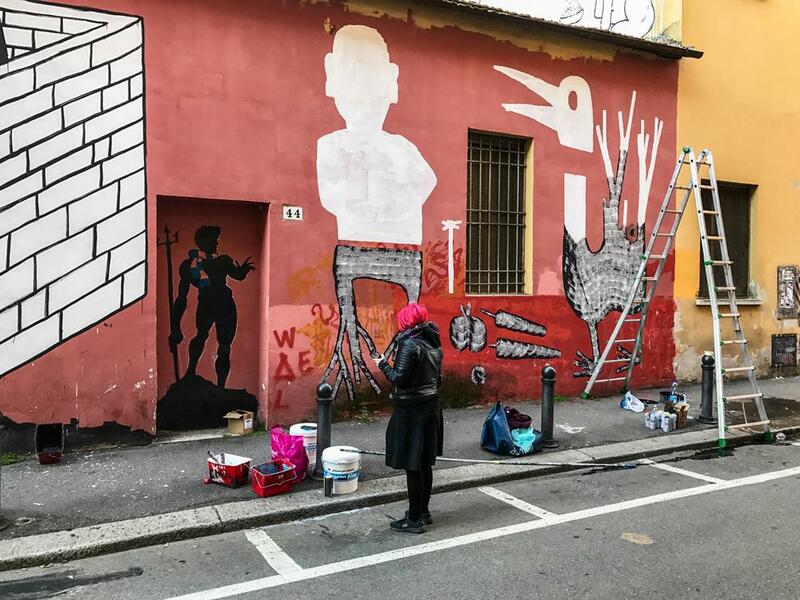 Làbas is a political organisation that has been occupying for more than four years a former military barracks in the historic center of Bologna, where social and cultural projects are nowadays conducted and developed. For many years now they’ve been developing structures to welcome migrants within the space, the collective practice of urban gardens against speculation and urbanization, the promotion of healthy biological food that is home-produced by local farmers as well as self-produced beers. Làbas also has an educational laboratory for environmental and cultural subjects for the kids of the neighborhood. It also became the home of several asylum seekers, students, temporary workers, retirees and families who over the years have passed by, and now 40 people of all ages and backgrounds are currently living inside the spaces of the barrack. There is also the artistic and cultural side, with hundreds of free concerts a year, book presentations and various occasions of street art. 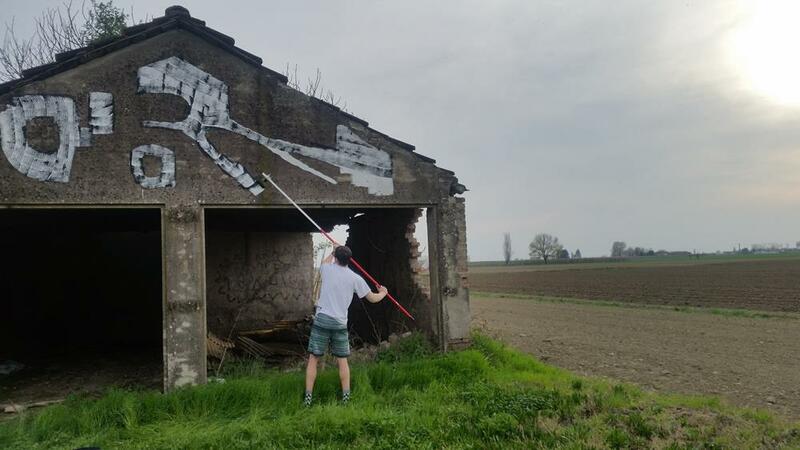 I have already supported them “with street art” last year, curating a mural by the artist Dzia from Belgium (I invited him and organize a trip) but they now needed something “stronger”. From September on I’ve been talking with them about their everyday risk of eviction because the Bologna city administration planned the construction of two shopping centers, parking lots and luxury apartments instead of the barrack. As they told me “We think that many people should share the values of our fight, for a different city that would promote green spaces, social spaces instead of speculation, that would care about the needs of our district first rather than paying attention to private business”. Therefore, we decided to organize together a two days artistic event, and I invited Nemo’s, Andrea Casciu, Digo Diego, 1UP/Kingsize, Skirl, Ruin, Cacao Rocks. Fifth day of travelling with artists; we were a bit tired (many of us haven’t slept so much) but so excited to take the train and go to Bologna, where we also would meet Nemo’s and Andrea Casciu. When we arrived at Làbas we’ve been welcome by the guys, helped with materials and organization. Before the artists started to paint we’ve been all invited to attend a meeting: they wanted to introduce themselves, explain something more about the situation and make us feel home. 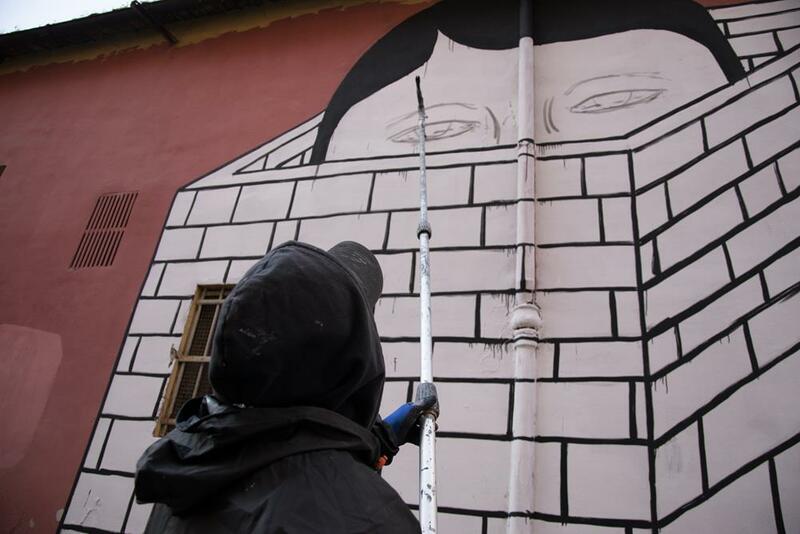 After that, we all moved outside and the artists chose their own portion of the external wall. While they were mixing painting, preparing ladders and spray cans, I took advantage of the moment to speak separately with each of them, reminding the main purposes, activities, features and events of the squat; as a curator I think this is something basic to do. Without forcing anyone, they were all grateful and took inspiration by my explanations. 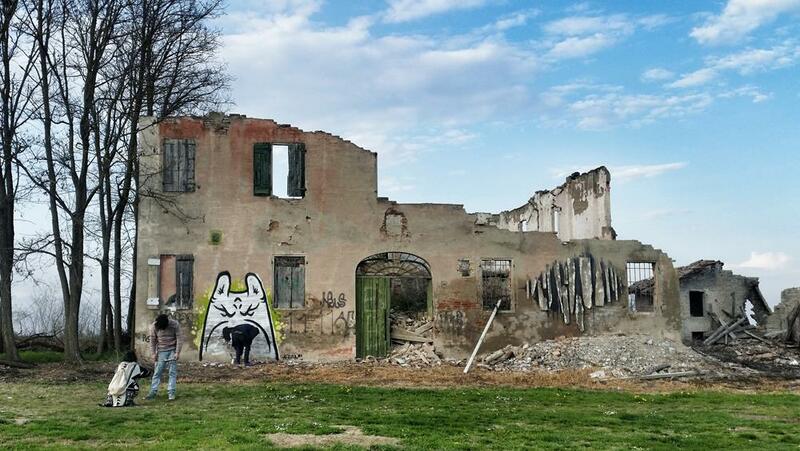 Digo Diego painted some houses, because of the right to housing and common properties; Casciu a fortress that symbolizes protection; Skirl and Ruin vegetables and other elements connected to the vegetable garden and self-productions in the squat and their organic and local food market. Elements that reminds strength and resistance would have been present in the murals of Bisser and 1UP (in the last one the Coursairs-the good ones, throw cakes at policemen-the bad ones faces). 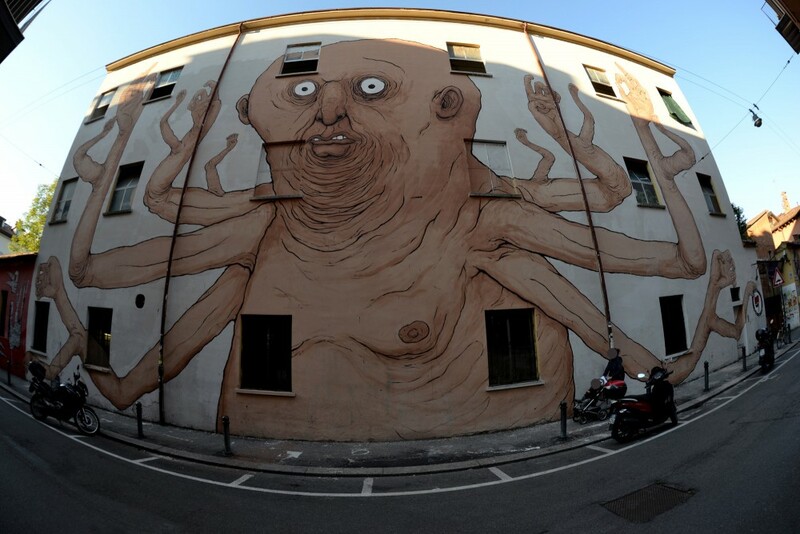 Nemo’s idea was to paint a huge man with many arms and hands, that remind me immediately the Hindu goddess Kalì (moreover I knew he had recently spent 1 month in India). The reason of this choice was to represent the will of the squat to “hug” the area and the city, take care of people, but most of all to show the power of act and cooperate together, to work actively for a change and an improvement. I must admit I’m proud of my choice: they were all aware of the cause and strongly wanted to supported it and during the event they’ve been talking with many people, making questions, enjoyed and explored the place (and of course I’ve done the same). First day was such a good and positive atmosphere outside Làbas: no problems at all, only smiles, sun, music and overall satisfaction. The artists had a big audience: of course guys from the squat but also inhabitants of the area, street art-lovers, photographers and of course many who new about the event. There were also many Urban Lives’ fans and friends, some of them with a copy of my book “Urban Lives” for a chat and a dedication on it, and the guys of Innesto and Rurales Emilia. While most of the artists were painting outside, Cacao Rocks was inside, building a new site specific and in-situ installation. This time he was the wood structures that the collective of Làbas uses in case of police attack, or just to protect themselves, during demonstrations. Like the ones of the others, this choice was symbolic too. Inside the squat there was also Nemo’s who, helped by many people, was working hard for preparing the ropes (for painting walls he uses to dangle from rappelling ropes), a preparation that took him several days. 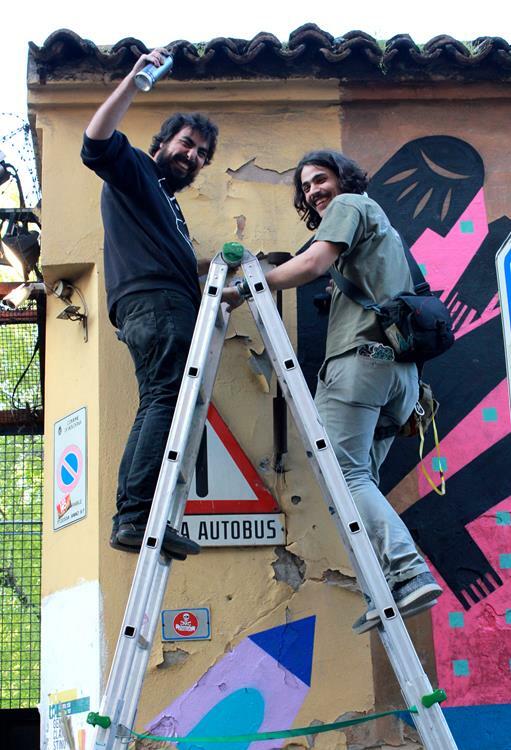 At dinner time Skirl, Ruin and Andrea Casciu had finished their (first) mural, Digo Diego and Bisser have half painted their wall, while the biggest wall painted by the 1UP, with the valuable help of Lo Sbieco (he was there from Reggio Emilia to help, and we really appreciated it!) were a little behind work. After dinner we spent some hours at the pub but that night we all decided not to be late: we’ve done so many things the previous days that we all had to catch up on some rest. Either because we all slept well or because we already felt home at the squat, the second day there was a wonderful atmosphere of cheerfulness, relaxation and unity. I had more time to chat with everybody, for a glass of wine with the guys of the squat, and also for a video interview with Letizia, for the TV channel CodecTV. About street art, unluckily Cacao Rocks had to stay home because was sick and Nemo’s had to finish his technical preparation. Digo Diego painted all day long to finish, Skirl and Ruin painted a second wall, and Bisser, Andrea Casciu and Skirl worked together on a combo. 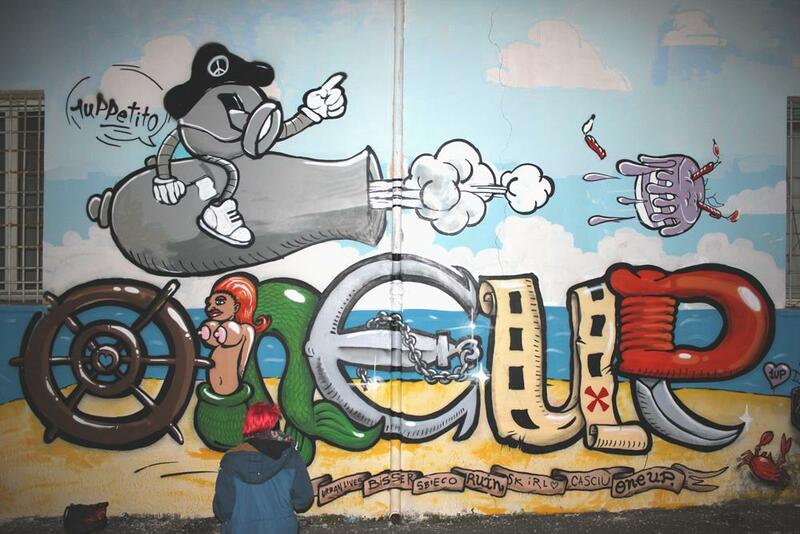 But what attracted and involved more people and more audience was the wall that Kingsize from 1UP was painting, again with the help of Lo Sbieco. Many details and characters started to appear, inside the story represented, with more and more references to the Làbas. 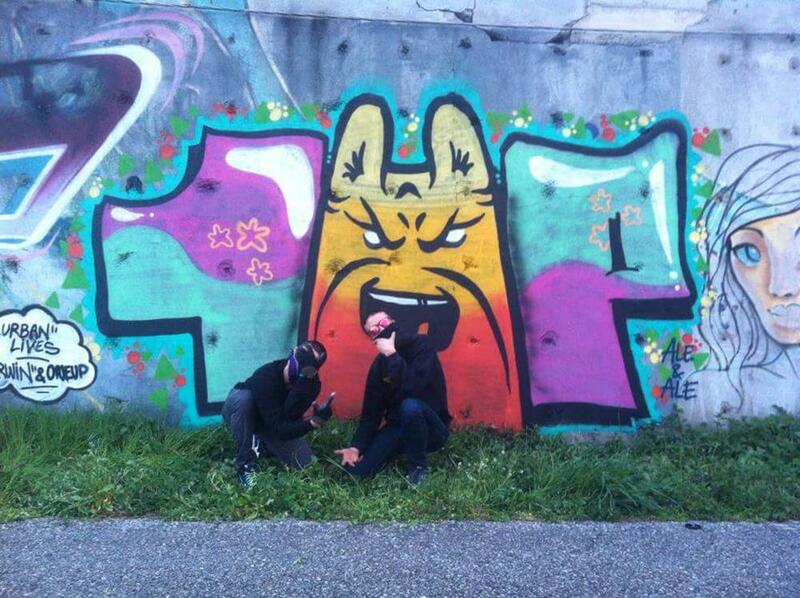 One of the best moment of these 2 days was to see all the artists in front of the same wall, the one of the 1UP. Everybody, except Nemo’s who was upstairs, decided to take part to his “collective mural”. After sunset Lo Sbieco had to return to Reggio Emilia, so I took his position as helper-friend-curator, till 9pm. I was so grateful with the guys of Làbas because they bring us two pizzas and often checked if we needed something. Last half an hour of working and painting was amazing: we were surrounded by friends and so many people supporting us, and taking some photos. When he said “OK, now it’s finished” after writing “We will resist” we decided to celebrate the special moment taking a photo: me, Kingsize and Letizia (Làbas). The perfect ending of two perfect days. 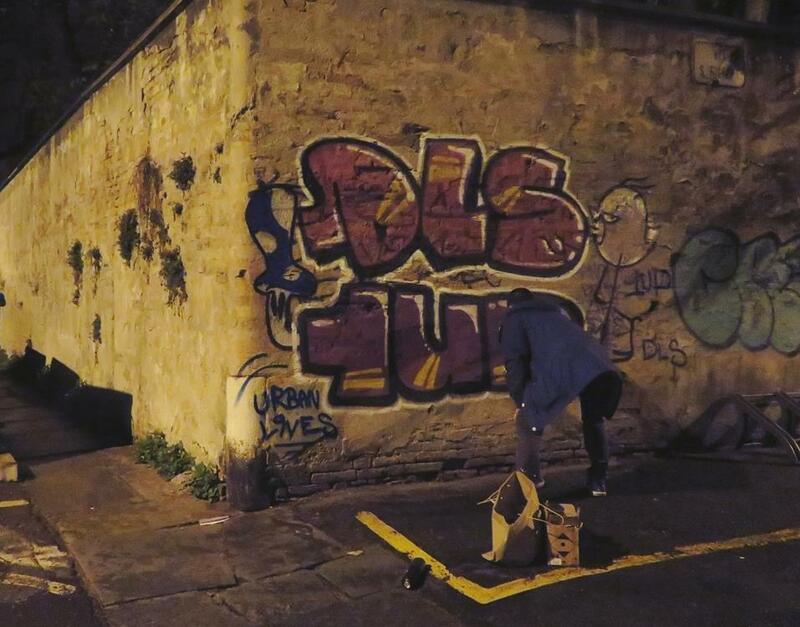 After that I moved to a pub with the artists and friends, we continued talking and drink also at home and just me, Bisser and 1UP decided to go out to take buy some other beers and they decided for a quick piece on a shutter, dedicated to me, Urban Lives! The following day was the one of the departures: Kingsize, Cacao Rocks+Eleni and Digo Diego had to leave in the morning, while me and the others enjoyed a day of market, party and music at Làbas. Was great to have fun all together, and feel like we were in a big family. Bisser and Nemo’s continued painting (I would have returned after 1 week for the promotional tour of my book, which included Bologna, and I had the chance to spend again some time there with Labàs and Nemo’s) while Skirl and Ruin painted some throw-ups and tags. What made more happy than everything else that day was to receive thanks by all the artists: one at a time they told me that it was one of the best experience of their lives, someone even told me that it was his favourite trip ever! I still can’t believe that “I did it”: smiles, laughs, art, connections, new friendships, new projects. This 1 week-trip in Emilia Romagna is unforgettable and I want to thank so much all special people who joined it!